Theresa May’s no-deal/deal went down by a 344 – 286 margin. Did her latest defeat signal three strikes and she’s out – her coup de grace of no return? 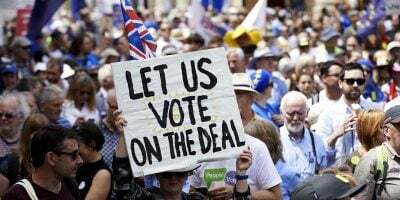 Britain has until April 12 to crash out of the EU with no deal or remain a bloc member, abandoning Brexit sine die, MPs strongly rejecting the former option. Ahead of Friday’s vote, May offered to resign if MPs backed her no-deal/deal. As things now stand, she’ll likely either step down voluntarily or be pushed in the coming days, her tenure as prime minister since July 2016 pockmarked with failure. Labor leader Jeremy Corbyn called for new elections, stressing Britain won’t leave the EU without an acceptable deal, adding if May refuses to accept that, she has to go. She called the implications of her third defeat “grave,” saying Britain is scheduled to leave the EU on April 12, adding she’ll continue pressing for an “orderly Brexit” – a notion she opposed all along without admitting it publicly as prime minister. In January 2017, Britain’s Supreme Court ruled against fast-tracking Brexit, saying “the government cannot trigger Article 50 without Parliament authorizing that course.” It’s for MPs to decide, not the PM or UK voters. So far, MPs rejected eight variations of May’s no-deal/deal this week. On Monday, they’ll vote perhaps for the last time on still another alternative. Before Friday’s vote, House of Commons Speaker John Bercow ruled that May could not call for a third vote without substantially changing her plan. She split her no-deal/deal apart. Friday’s vote was on a transition period post-Brexit if occurs. Omitted for a future vote was the hard part – a declaration on Britain’s relationship with the EU if it leaves the bloc. Her strategy let her circumvent Bercow’s ruling, accomplishing nothing else. Losing for the third time likely drove the final stake into Brexit. Only its obituary remains to be written, along with postmortems about nearly three wasted years of parliamentary debates and negotiations with Brussels. May’s days as prime minister are numbered. She and Brexit are doomed – the latter long before Friday’s vote. Note: If majority MPs have a change of heart on Monday, agreeing to accept May’s deal after all, perhaps with minor changes, it’ll still be a no-deal/deal. It’ll amount to Britain pretending to leave the bloc – doing it in name only, not in fact. No wonder, millions of Brits, a likely majority, are fed up with what’s gone on, wanting either a new referendum or revoking Article 50, abandoning Brexit altogether. I’ve favored a hard Brexit all along, a clean break, walking away and not looking back. Disruption would likely be much less severe than Brexit opponents claim, along with being relatively short-term. Britain is a leading European country. Others on the continent surely want current economic, financial, and trade relations maintained. It’s mutually beneficial to all European nations to have things this way. A year post-hard Brexit if occurs, Britain’s relationship with EU member states would likely be much the same as now.